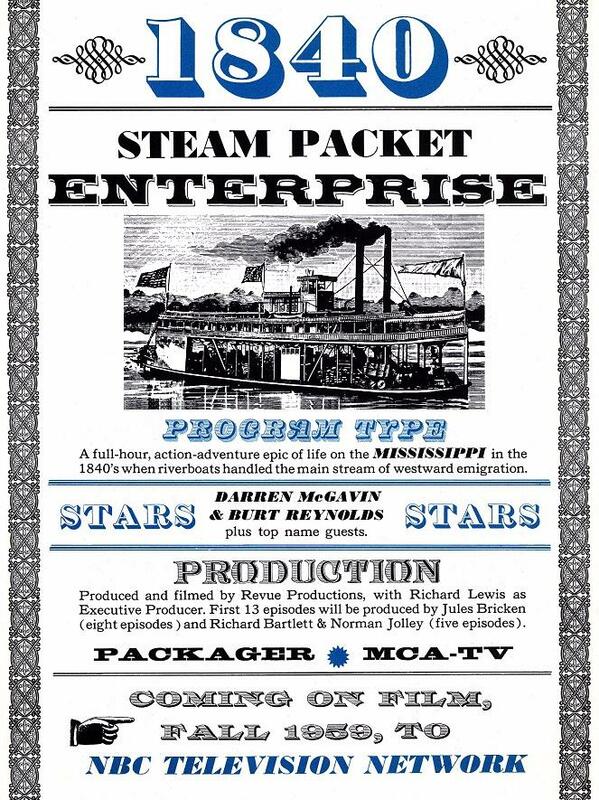 THIS PAGE shows the Enterprise in MISSISSIPPI GAMBLER and the TV series RIVERBOAT. To see the ENTERPRISE in other movies, go to page 2 - click here. 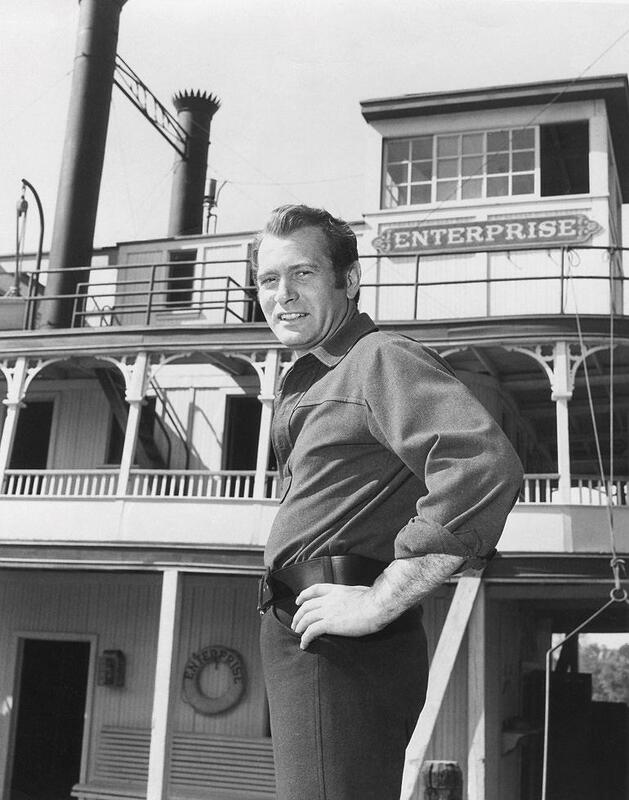 Named "JOHN B. DICKEY" for MISSISSIPPI GAMBLER, stunt men play the heroes and villains having a brawl on the bow of the boat filmed at night. 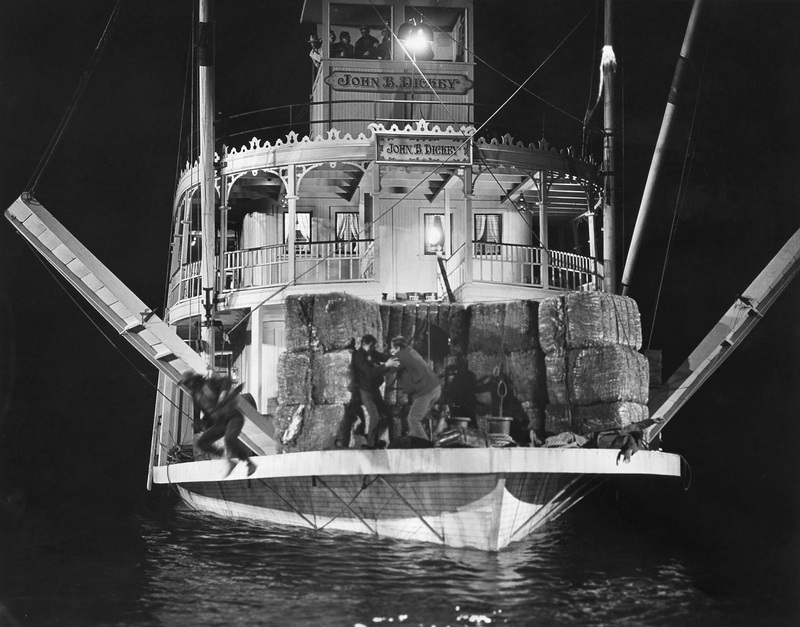 Note the stunt man jumping overboard on the left appears to be wearing "sneakers" which stunt guys often used because they got better traction on slick surfaces and were less likely to slip than when they wore "everyday" or period costume shoes. There's a light in the pilot house and another in the cabin on the boiler deck that are hitting us smack in the eye, the lighting cameraman probably had them put there because the motion picture camera was positioned at an angle where it wouldn't see them. This is the best view I've ever seen of the front of the boiler deck cabin of Universal's riverboat. Here the motion picture camera is set up on the boiler deck looking down on the stairs where character actor John McIntire convenes with leading man Tyrone Power. "Boom operator" upper right holds the microphone above the actors to catch their dialogue for the sound recordist. 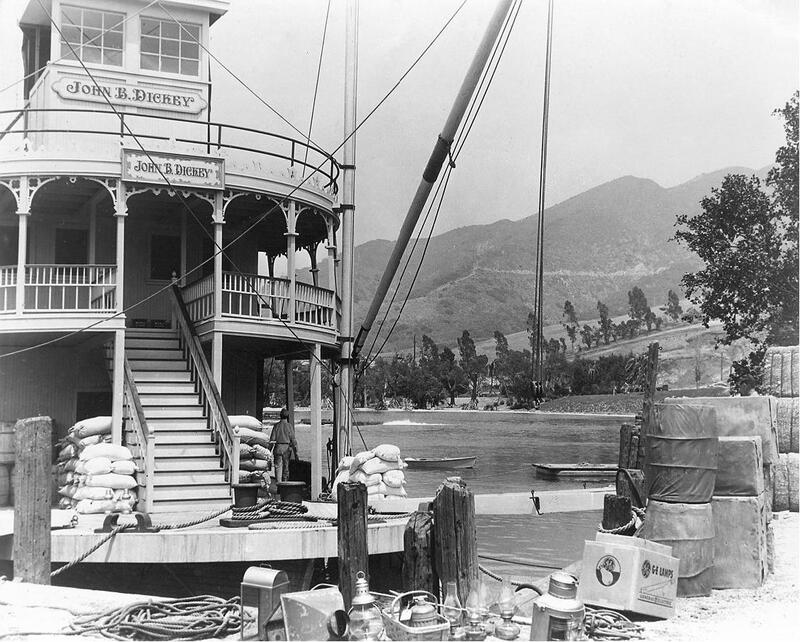 A nice selection of nautical lamps sit on the shore waiting to be installed by a studio electrician aboard the steamboat set which is floating on what appears to have been a much bigger back lot lake at Universal studio in 1953 than exists today. 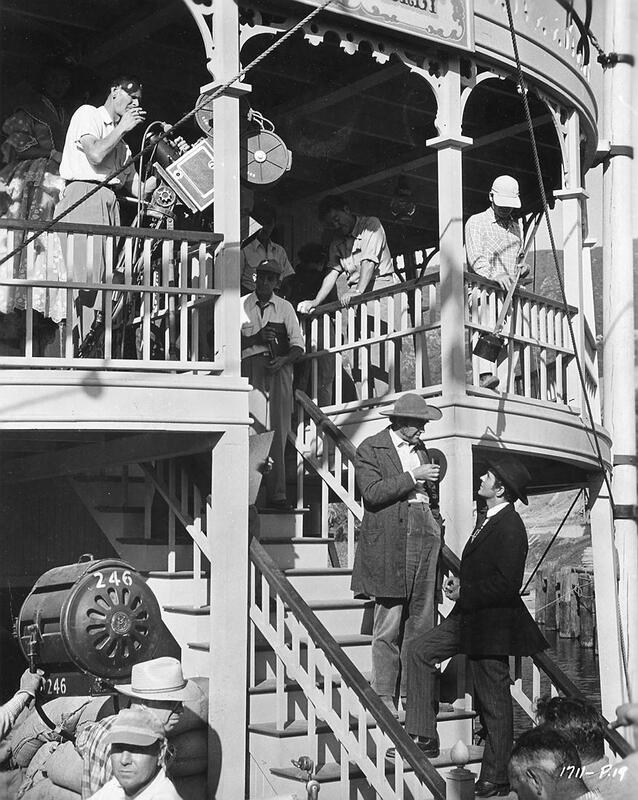 For those folks who are captivated by "behind the scenes" movie photographs, here's the cameraman and microphone boom grip on the boiler deck of the movie set capturing the performances of Tyrone Power as Mark Fallon standing on the staircase below gambling partner John McIntire as Kansas John Polly. General Electric get a nice plug here with a box of their light bulbs in a box lower right. Note that the sides and back of the pilot house have had their windows removed and black backing secured behind the stern and port side walls for some particular requirement of the director or cinematographer for a sequence the set is being prepared for. 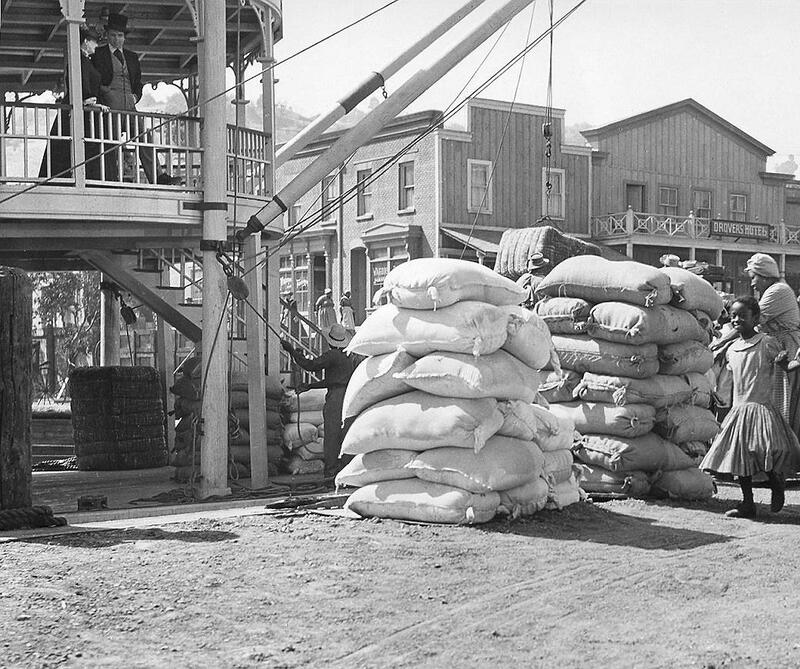 Here's a unusual "behind the Scenes" photo taken during filming of MISSISSIPPI GAMBLER at Universal. The lighting cameraman probably requested that the portside bulkheads of both the pilot house and the cabin below be draped with black fabric to facilitate shooting from a particular motion picture camera angle from down below. The horse drawn carriage lower right adds interest to the composition. 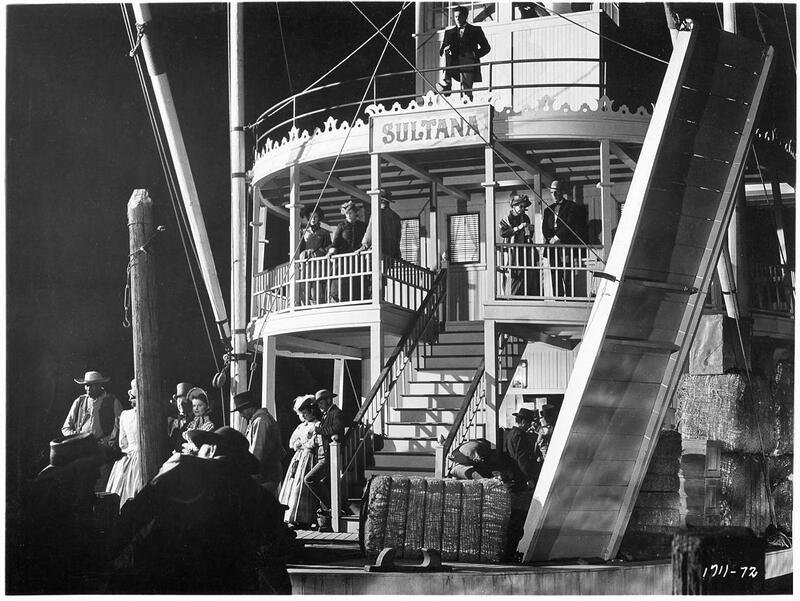 Tyrone Power as gambler Mark Fallon is seen standing in front of the pilot house above the name SULTANA as the boat was called in this sequence. 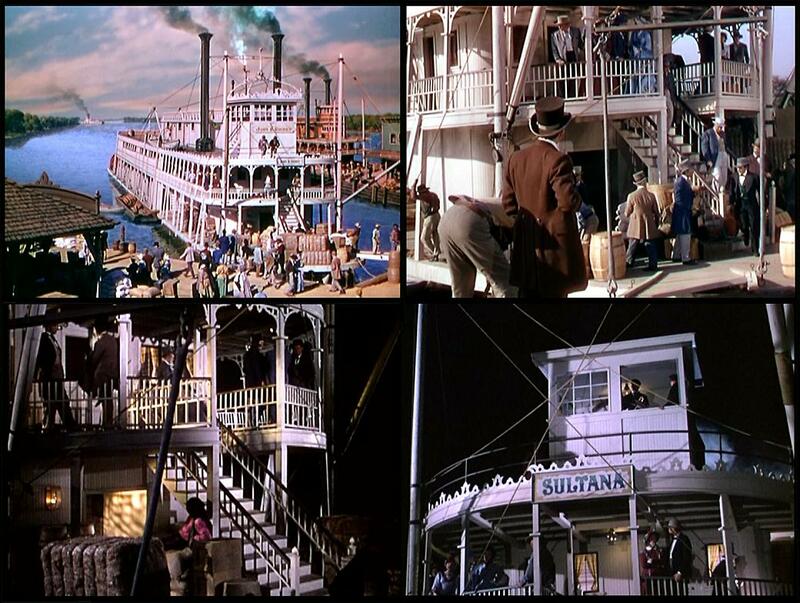 The frame on the upper left of the St. Louis landing was composed of live action and a matte painting which extended the stern of the boat, the river itself and added a boat in the distance and another one on the right. Upper left the boat's name was "JOHN B. DICKEY" and in the lower right "SULTANA." 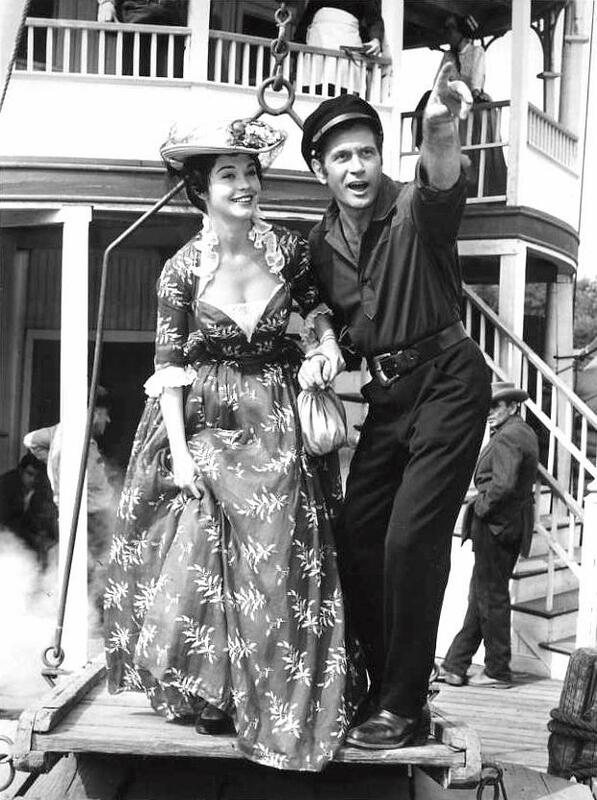 Darren McGavin as Captain Grey Holden on the swinging stage of the ENTERPRISE with actress Valerie Allen whose character was given no name but referred to only as "Brunette at table"
"Vance Muldoon offers Government agent Carruthers a chance to earn some money - by sneaking liquor to a tribe of Indians." Ben Frazer, pilot of the ENTERPRISE: Burt Reynolds. 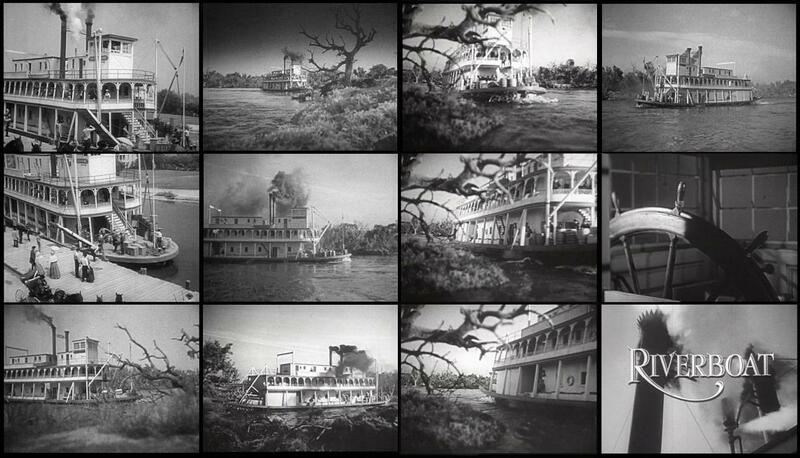 A number of episodes of the 1959 - 1961 TV series RIVERBOAT are available from NETFLIX. Attached 12 screen captures from the first DVD. 8 of the images are of a scale model. The distributor credit for the DVD's is Timeless Media Productions. This was from a very unusual promo booklet from 1959 promoting the upcoming RIVERBOAT series. 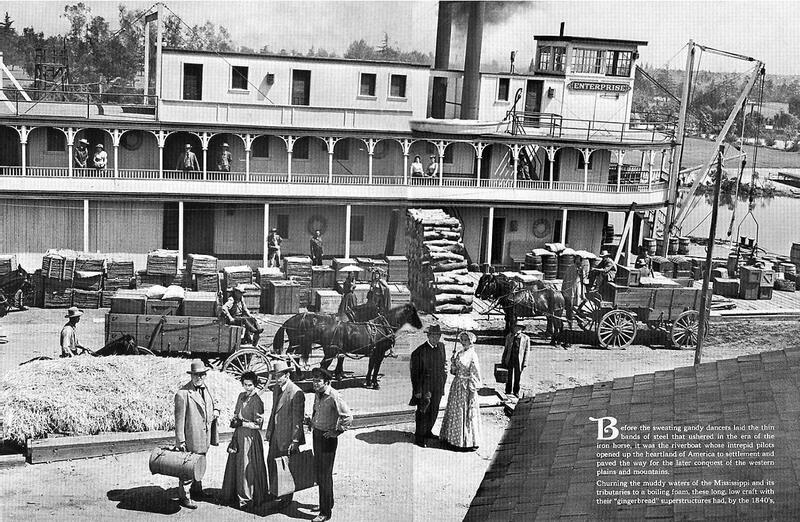 The "Rebecca Everingham" was considered the most luxurious of the steamboats on the Chattahoochee River. It was build in Columbus, Georgia in 1880. 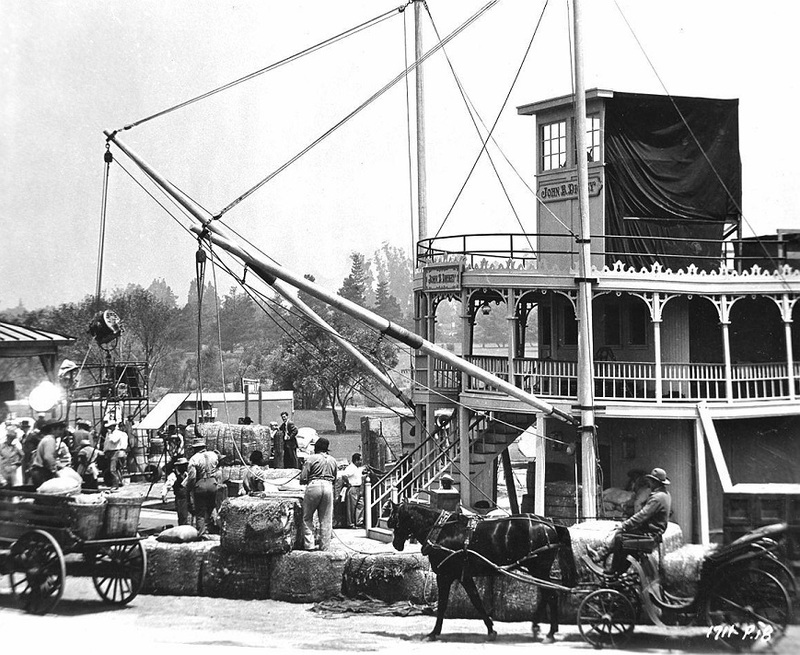 It had more than two dozen ornate staterooms and a capacity of 120 passengers and about 1,000 cotton bales. It operated from Columbus and Apalachicola between 1880-84. It was destroyed by fire at Fitzgerald's Landing, four miles above Florence, GA, on April 3, 1884, with a reported 11 fatalities. The fire reportedly was caused by a falling particle of carbon from an electric light. The boat was mid-stream when the alarm was sounded. Links to two unusual recordings from the late 1950's on YouTube of Elmer Bernstein's theme for the RIVERBOAT TV series. The first is a sometimes "corny" orchestration of the music that was played in a more conventional arrangement under the opening and closing titles of each episode. The second is a "leisurely & smoky" vocal sung by Monica Lewis in her guest role as "M'liss McCabe" in the Season 1 Episode 4 RIVERBOAT episode entitled "A RACE TO CINCINNATI" It was released on a Bristol Records 45 rpm single which might have had an orchestral arrangement of the song on the "flip side." 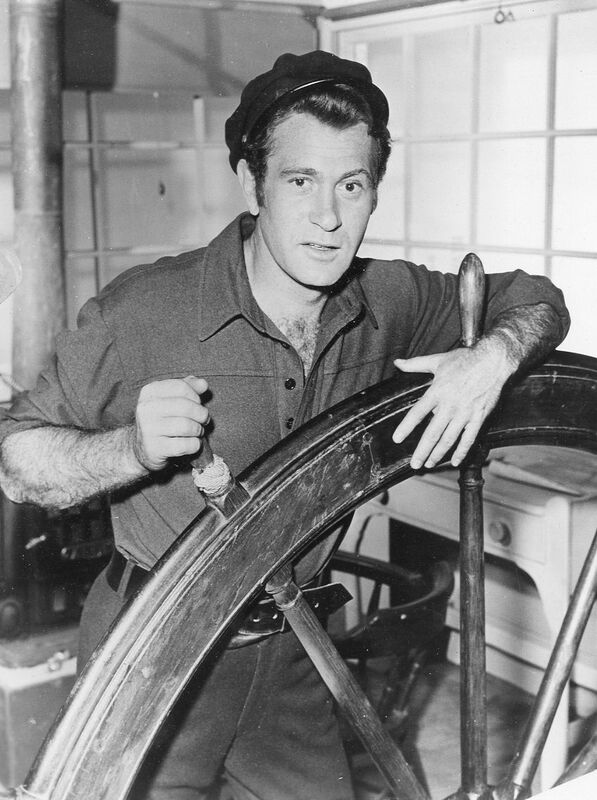 "I sang this leisurely Southern-flavored tune, "Riverboat," during a guest shot in an episode of the 1959-61 NBC series of the same name—a television "Midwestern" starring Darren McGavin and Burt Reynolds and centered on a riverboat traveling the Mississippi, Missouri and Ohio rivers. With music by the great Elmer Bernstein and lyrics by Irvin Graham, the song was released as a 45 rpm by a label called Bristol Records in 1959—the year my episode aired. Special thanks to my Facebook friend Tom Wagner for locating this old tune of mine. eBay listing from January/February 2019 with Universal's "Enterprise" sternwheeler from the RIVERBOAT series. 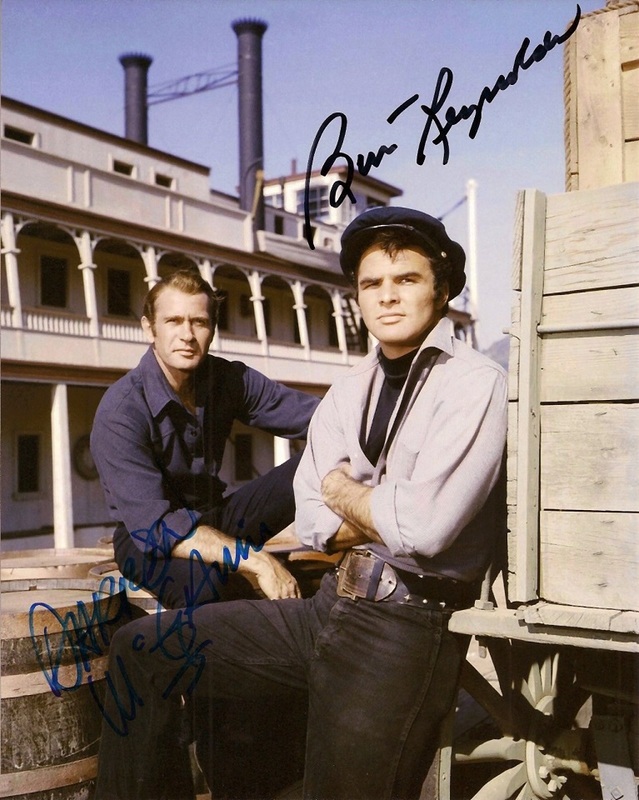 Color 8 x 10 featuring and signed by co-stars Darren McGavin as Captain Grey Holden and Burt Reynolds as Pilot Ben Frazer.